Here's a short article for MAHA 2012. Yesterday, I spent 4 hours there but only managed to visit a few of the exhibition sites, namely the farm animal site, the main exhibition halls and the associated bazaar, plus the floriculture bazaar. I have not stepped into the pineapple farm area, the paddy area, the birdnest/swift site, the floriculture park, the mini fun fair park (with water activities), the state pavillions, the stage area, the fisheries area, the state food section and God knows what else is there. The very first shortcoming is the lack of clear site info on the expo ground. So do your homework before you leave for MAHA 2012 at MAEPS. Tolumnia Golden Sunset (formerly Oncidium Golden Sunset) unknown cultivar. 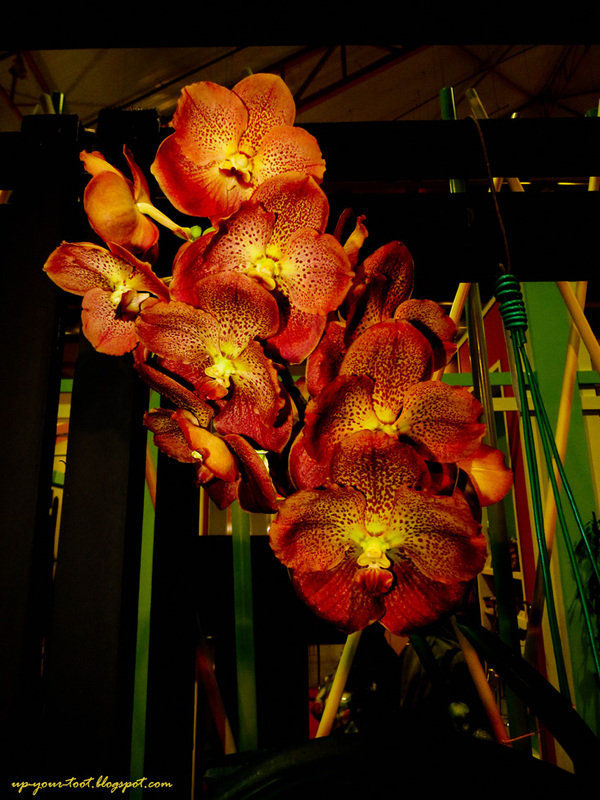 This is one of the orchids in the competition display at the exhibition hall. Tolumnia Golden Sunset is a highly variable grex, with colours ranging from pink with magenta spots to clean yellow. The next thing you must remember is which entry point you came into the expo: Site 1 or Site 2. You will be given a parking card (parking fees is RM3 per entry), which states which area you parked in. Make sure you bring that along. If the number starts with 1, you entered through Site 1 (Arrival Area 1), if it is 2, then Site 2. Site 1 is closer to the main halls and floriculture area. Site 2 enters directly into the animal husbandry area. These two sites are connected by trams (need to do multiple changes to cover all sites) or by bus, which sort of skirts the entire loop of all the exhibition sites. Hence the bus may take a while to come by. Rhyncholaeliocattleya (syn. Brassolaeliocattleya) Haadyai Delight. A beautiful yellow-orange concolour orchid with a very sunny disposition. When you need to get back to your parking area, do ask the volunteers dressed in green polo shirts. And make sure that they tell you where to get off, and what tram to change to. While trying to get back, I was told to take the tram from Site 1 entry to the pavillion, and transit. I got on to the next train, and was told to get on another tram. On this tram, I took a leisure ride round the loop as I was not told that I need to change to another train, i.e. at the paddy area to tram D (yes, there are 4 routes for the tram, the fifth route being the bus route) to get to Site 2 entry point. So round-and-round I went (makan angin tengok pemandangan), with a few others who were in the same boat, er...tram. Mind you it was late and I was tired. MAHA Besar (huge) - so many sites and so many things to see. MAHA Bazaar (like a huge bazaar) - many stalls selling all sorts. Very much like an oversized pasar malam (night market). I think it can go into the Book of Records as the biggest night market. MAHA Belanja (spend big) - you can buy lots of stuff, be it food, plants, machinery, animals etc. So keep an eye on the cash flow. Luckily I went with only RM20 in my pocket. MAHA Memakan masa (takes up a lot of time) - Too many things to see and a large ground to cover. 4 hrs that I spent there I have only scratched the surface. MAHA Pening (Great confusion) - Very poor onsite indicators and signs. Which is why it also takes a lot of time to get to where you want to go to. MAHA Membuka mata (A great eye opener) - You can see how to milk a cow or buffalo and realised how difficult it is to do it manually. Also all the strange plants, weird breeds of poultry and goats, different kinds of fruits and processed foods. MAHA Kecewa (Great disappointment) - The exhibition halls are pathetic, except for the Government and GLCs hall. The international hall is quite empty with a bizarre array of exhibits (P. Ramlee pun ada) and the local halls are more like pasar tani crossed with a supermarket. MAHA Becak (Really muddy) - The grounds gets muddy with rain, and they have to put 'walkboards' (read planks) for people to cross the bazaar area or exhibits. The toilets are wetter still and muddy with all the mud tracked in by peoples shoes. Understandingly they are still improving on the Expo, as it has only been held on this site (MAEPS) for 4 times (since 2006, if I am not mistaken). Lastly, here are some photos. Most of it are dark as I arrived there in the evening. 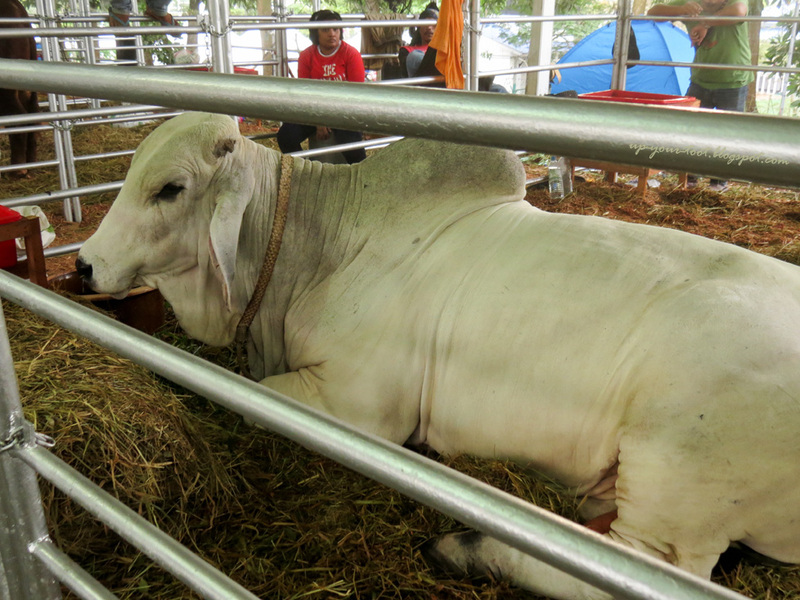 A Brahman cow. Apparently she is expensive. I didn't ask exactly how much (why in the world would I be interested in buying a cow?). 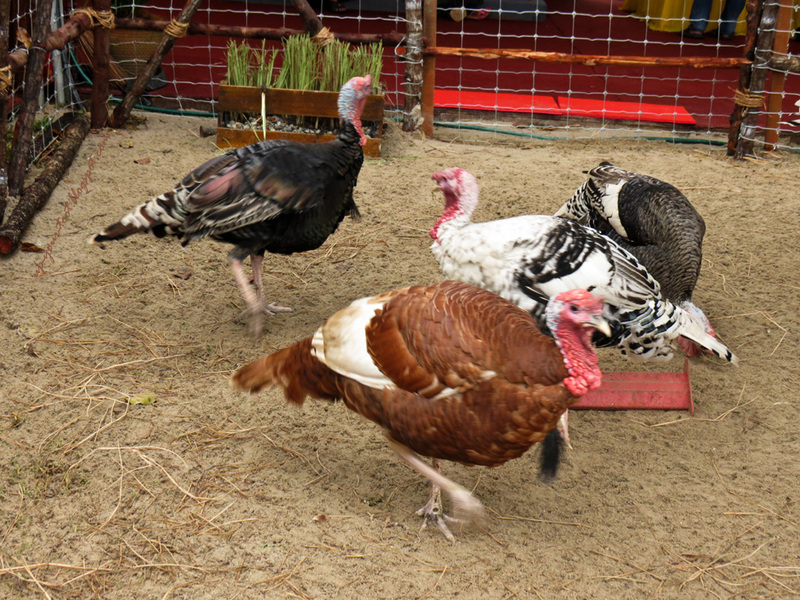 Gobble, gobble, gobble...Saved from Thanksgiving, perhaps not from Christmas. They must sense that I had a Christmas turkey with stuffing on my mind when I took this shot as they were running around trying to get away from my camera! 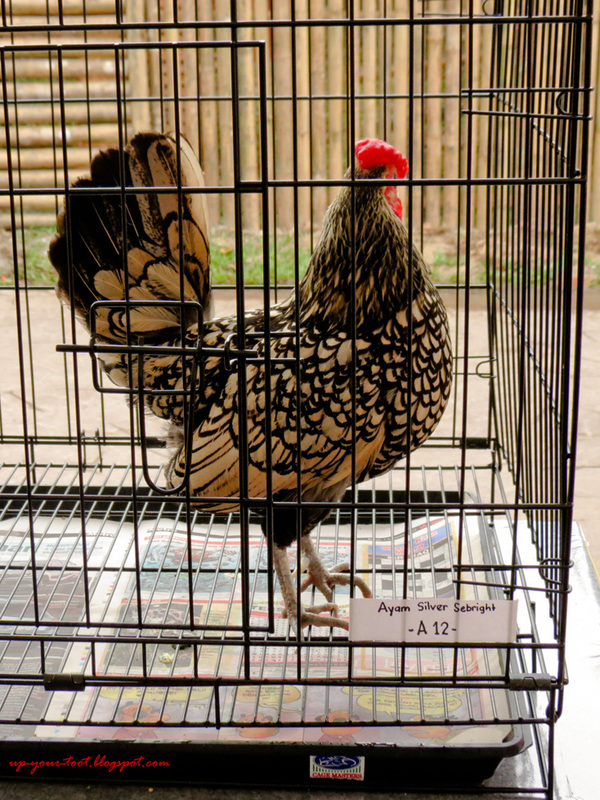 A camera-shy Silver Sebright Bantam (Ayam Serama Silver Sebright). He kept on turning the other way...perhaps he only wants to be shot by professional photographers. 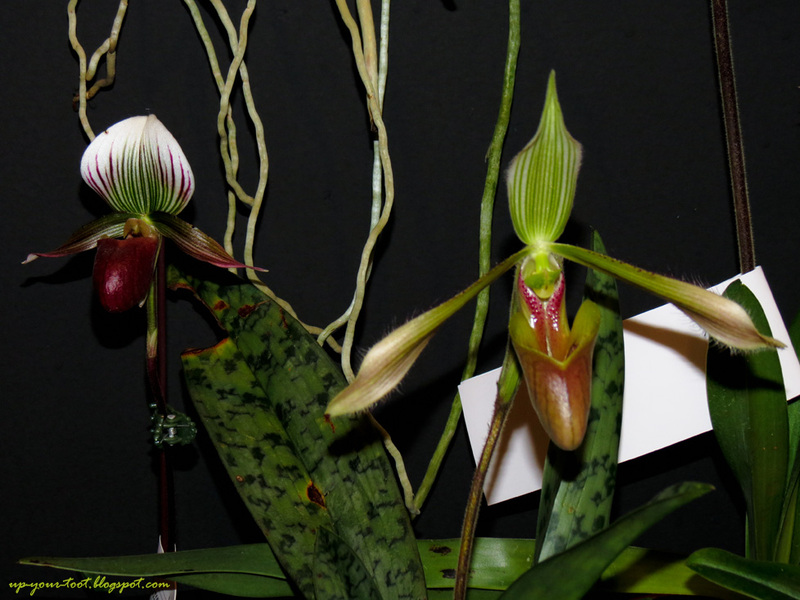 Paphiopedilum dayanum (right) and Paphiopedilum barbatum (left) according to their labels. The label reads Vanda Dr Anek x Suksamran Gold - I believe it should be properly labeled as Vanda Doctor Anek x Ascocenda Suksamran Gold. 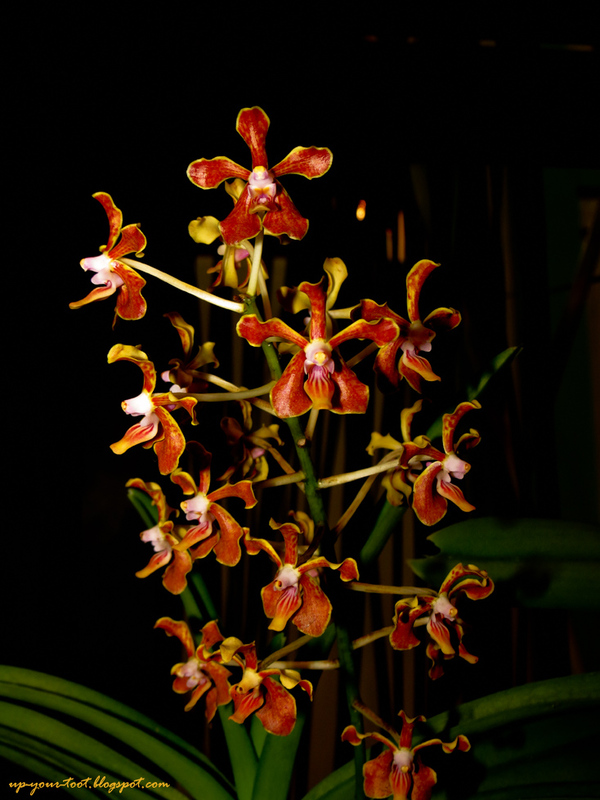 This cross is registered as Ascocenda Chantra in 2008 by Api Orchids. 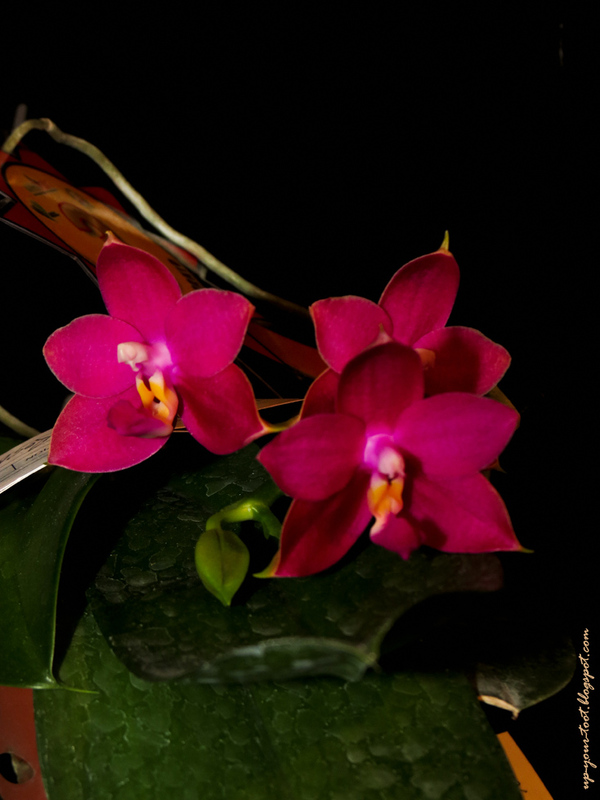 This intensely magenta-shocking pink Phalaenopsis was labeled as Phal. Tan Lee Moy x Taiping Ruby. 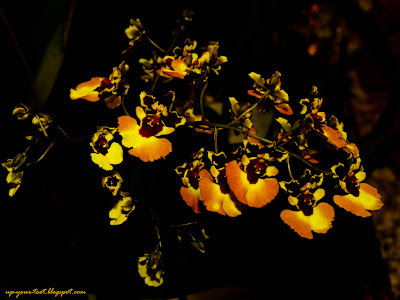 A check with RHS Orchid registry indicates that a reciprocal cross has been registered...and guess what is the name of the reciprocal cross - Phalaenopsis Permata Rosmah Mansor! Patutlah kalernya menarik semacam je. 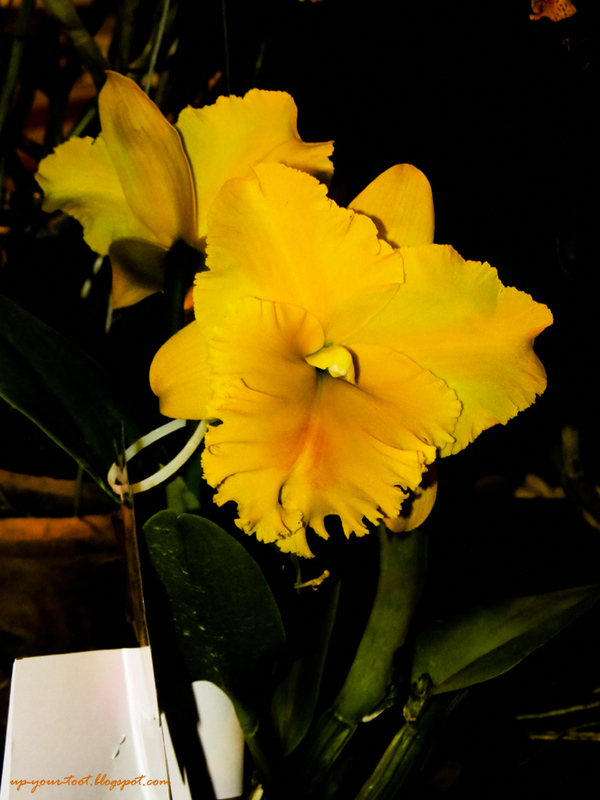 In orchids, reciprocal crosses are considered the same, and hence carry the same registered grex name. The reciprocal cross, sempena Kak Ros kita, yang lagi garang warnanya berbanding yang ini telah didaftarkan oleh R.Ang Chee Soong pada 2010. The tag says Vanda limbata. Most Vanda limbata floating around on the market are hybrids. The Agricultural Department also have an exhibit on rare local fruits. 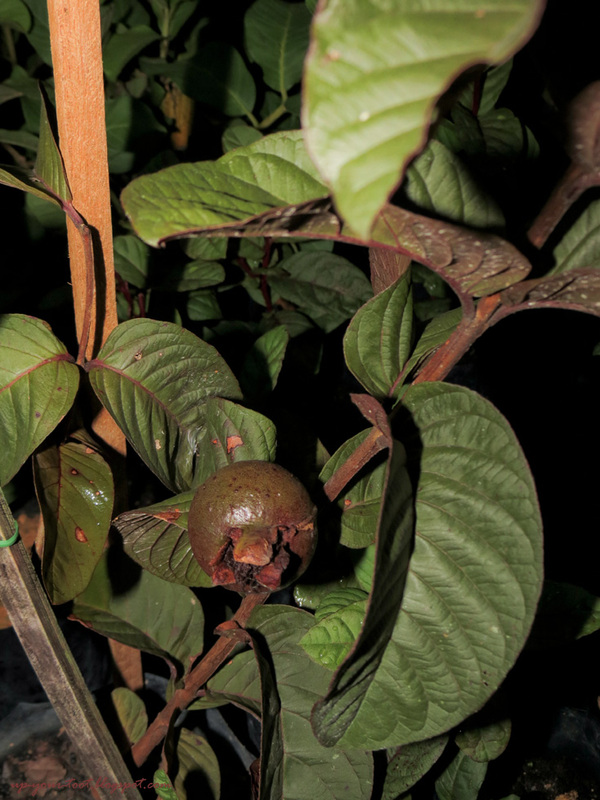 Pictured here is Cerapu (Garcinia prainiana). If you think it looks like a mangosteen or Asam Gelugor then you are not mistaken. They are all related i.e. from the genus Garcinia. If you haven't seen buah engkala, dabai or kelubi before, please visit this exhibit. One of the 'strange' trees on sale at the floriculture bazaar - Purple Guava. So move aside the white guave, and push the pink guava off the stage. Here comes purple guava! 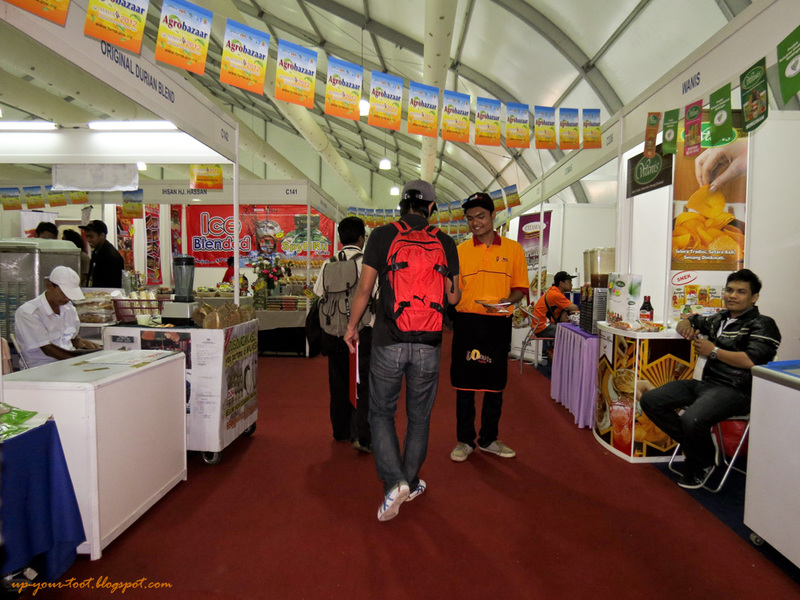 At the Agri Bazaar, you can sample processed food by local companies to your hearts content. A lot of them seems to be selling kuih lapis Sarawak. Why ah? Pesanan khas dari tuan punya blog: Saya sudah MAHA, anda bagaimana?? All about MAHA ya..maha this maha that.. K Mar tak MAHA lagi.. Again utk kesekian kalinya.. En Din tak brape minat..bila sebut becak.. Lagi la.. May be one fine year..
oh ya buah cerapu k mar pernah masak gulai lemak cili api dengan ikan..banyak pokok di Kuala Pilah.. En. Din's side, my side seumur hidup tak pernah dengar and makan .. bagus sebab ingatkan buah ni.. nak kena balik kampung baru dapat.. I think all the Kuala Pilahan's love this fruit.. buah yang dah masak ranum pun boleh makan mentah rasanya..
Eeee bestnya dapat makan buah cerapu. Kawan I kata rasa mentahnya yang masak ranum masam manis macam buah mandarin, sedap. Kak Mar boleh dapatkan anak pokoknya tak? Kak Mar...Diana pun nak join hehehe...boleh dapat tak anak pokoknya? Lamo tak balik Kuala Pilah sebab semua dah pindah ke bandar Seremban atau area Lembah Klang ni. Yang ada pun kat Pilah tu keluarga arwah Pak Lang adik papa Diana. 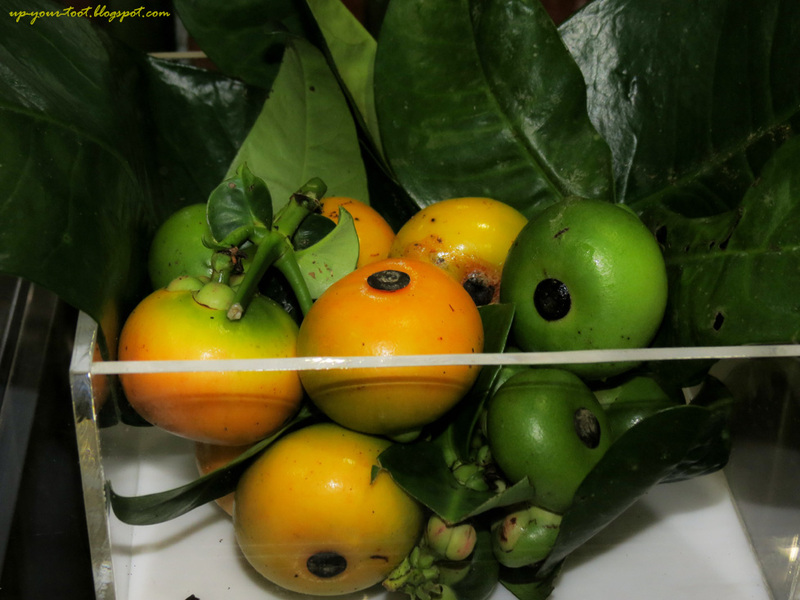 Diana ada bawa balik anak pokok dari Queensland nursery diorang kata yellow mangosteen(Garcinia xanthochymus),main sedap beli je tapi tak tahu actual apa namanya kat Malaysia. Sean familiar tak with this species. Ha, that is a pokok nadir yg sgt jarang dilihat skrg - asam kandis. Take good care of the tree. Kot kot kat kampung ada, tapi generasi sekarang tak tahu yg tu pokok asam kandis. Kak Mar, Diana, saya minat pokok cerapu sebab diantara pokok-pokok dalam keluarga Garcinia, yang inilah salah satu yang boleh ditanam dalam bekas (container planting) dan dikatakan boleh berbuah dalam keadaan container planting. Yang lain kebanyakannya pokok besar dan susah di'bonsai'kan. Diana, Garcinia forbesii is a fluted fruit like asam gelugor but more ovate in shape, G. xanthochymus have smooth skin. Kalau big boss minat ikan laga, bermacam-macam keropok, makan durian, bolehler umpan dia pergi. Kena pergi at least once. Went to MAHA on the first day 23rd after lapor diri dengan UM coz alang-alang keluar and we did not want to go there during weekend which predictably too many people. I also only scratch the surface je masuk from pintu 2 after pusing-pusing sesat sebab tak biasa ikut jalan from KL arrived about 5PM. We usually from Kampung Kubu Gajah our place exit Guthrie highway than masuk yang KLIA highway tu. I also took picture of that Brahman cow. I think OZ nak try buat hybrid brahman cow and tak ingat lagi satu species because brahman lagi tahan panas sebab dari India kut. Masa round area perternakan tu dah gelap jadi banyak tutup. Tak sempat tengok turkey, kalau ada jual turkey betina rasa nak beli hehehe...sebab kesian we only have a male turkey and his harem is at the moment 2 ekor ayam mutiara. Thinking of going on Wednesday again sebab nak tengok auction deer berapa seekor budget...berangan-angan nak bela pula and cover area yang tak sempat tengok. Kami tak pergi pun site floral because tak siap pun lagi. It was really dissapointing on the first day banyak site and booth tak siap lagi. Semua masih terhegeh-hegeh nak prepare. Malam nak tutup pun masih buat booth tengah nak cement lagi sebab nak kejar perasmian keesokkan harinya.Yes it was really confusing with the bus and all , takde banyak guide notice. Takde membeli sangat pun spend less RM50, nak tengok-tengok je dulu. Sesat juga eh...So I wasn't the only one. It would mean that we were both at the place at the same time on the same day! Kesian si turkey jantan u. I tak pasti pulak sebab tak tanya tuan punye syarikat. I sibuk ambik gambar je. They should improve on the signage. Kesian orang tua yg pusing-pusing entah berapa round. I sempoi je...siap kata dgn makcik, boleh tengok pemandangan sekitar MARDI. Tapi dah gelap gelita, mesti makcik tu confuse. Ha ha. .confuse la makcik tu..pemandangan gelap gelita...smlm lalu je masa senja dah gelap..nasib tak langgar kereta yg parking disusur keluar..ingat kereta rosak..bahaya betul..
Kami lagi lah naik bas from 2nd pagar tu first time pusing balik ke the original platform...we were not the only one 2 families also like us because tak tahu mana nak turun naik sama-sama. Kami pandang memandanglah lepas tu tersengih-sengih semua tak tau mana nak berhenti senasib. Mungkin makcik tu ingat saya dah gila, boleh je kata tengok pemandangan dalam keadaan gelap-gelita. Wah bahayanya kereta tu main letak kat tepi jalan. Nasib baik Kak Mar nampak. Kalau saya dgn mata rabun ayam saya nih, kot-kot dah sondol terus kereta tu. Diana, at least you naik bas, ada suspension. Naik tram yang takde suspension round beberapa kali terus rasa lain macam je. They should make announcements when approaching the stops (pavilion ke, pentas utama ke, laman padi etc). Sean I am looking for volunteers either Saturday or Sunday :P.
I actually wanted, was pinning to go to MAHA but didn't. Sounds very kelam kabut and penat-lelah lah. How nice if the TV stations do a live coverage so I can just watch everything and no need to go all the way there. It was penat-lelah and basah kuyup, lol. I came back on one trip dripping wet from the rain. Yeah, that is a good idea. They should have it on web broadcast of something like that.